The idea of waging a war to capture market share in a booming economy like India is not new to companies. After the liberalisation of the economy in the mid-90s, many companies took big bets on Indian markets; a lot of them gave away profit margins for the short term in pursuit of market leadership and later leveraged their dominant positions to create a strong P&L for themselves. Globally, the consumer internet market has been following a similar trend, i.e. investing to create a large customer base and then monetizing the large customer base to create a profitable business model. But the ever elusive profit margins and the reasonably “long term shot' on the e-tailing industry has created a classic love-hate relationship between investors, industry analysts and the customer base. Needless to say, the same story is playing out in the world's 3rd largest economy (in PPP terms) as well. In the Indian consumer internet market, an additional anxiety amongst the aforementioned stakeholders is created by the fact that the key performance metrics are more skewed than for the global peers. The ideas largely generated in the Silicon Valley, and successfully tested in China are being pursued in India, a classic case of This-of-that strategy which most of the funds and e-commerce companies have followed globally. A lot of debate is going on related to the valuations and the future of some of the leading e-tailers of India. Some quarters are going as far as to say that the doomsday for the Indian e-commerce industry is close – at least for some players. Keeping valuations apart, India presents a bullish picture for the online market as it is pegged neutral to positive for all the above listed parameters. According to RedSeer estimates, the market would be between USD 100 to 120 billion by 2020, only the third largest after the US and Chinese market. The growth posted by Indian e-tailing Industry in last one year is 130%+ (q-o-q for Q4 for each year) and since CY2012, the CAGR has been close to 100%, which is a 5-6X multiple of any developed market, on the largest base of any developing market. Growing at this pace, the Indian e-tailing market will become ~15-20% of the US market size in next 5 years from current ~4-5%, which is a large opportunity by any standards and the key reason the Chinese, US and now Japanese players are so aggressive on India. The challenges with the Indian e-tailing market are different, and they are certainly not the growth related. The serious challenges are between the points 1, 2 and 3. Point 4 is something which all businesses in India have come to terms with and the concept of the great India jugaad works around the same. Points 1,2 and 3 are all linked in the sense that high price sensitivity of the customer drives up the cost of customer acquisition, while lowering AoVs, leading to the high burn rates. In Indian e-tailing, AOVs are around USD 33 and cost of customer acquisition is USD 18-20. Price sensitivity, and the resulting low customer loyalty is the other major issue faced by e-tailers in the Indian market. Last year, when one of the biggest e-tailers reduced/rationalised the prices on its portal in its quest of profitability, it didn't expect that within 2 quarters, its GMV will drop down by almost 50% (in a market which has grown ~120% on a YoY basis). A similar story has also played out with a leading fashion e-tailer in India, which saw a 30-40+% m-o-m drop in GMV once heavy discounting was curtailed with the aim of reducing cash burn. 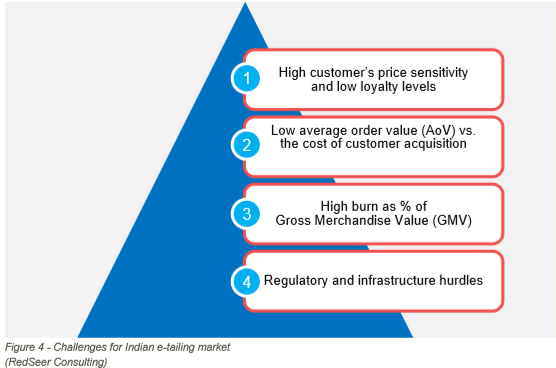 Thus, the test of price sensitivity and brand loyalty has failed the Indian e-com market repeatedly, putting major roadblocks in the Indian etailer's journey to achieving the holy grail of both GMV growth and profitability.